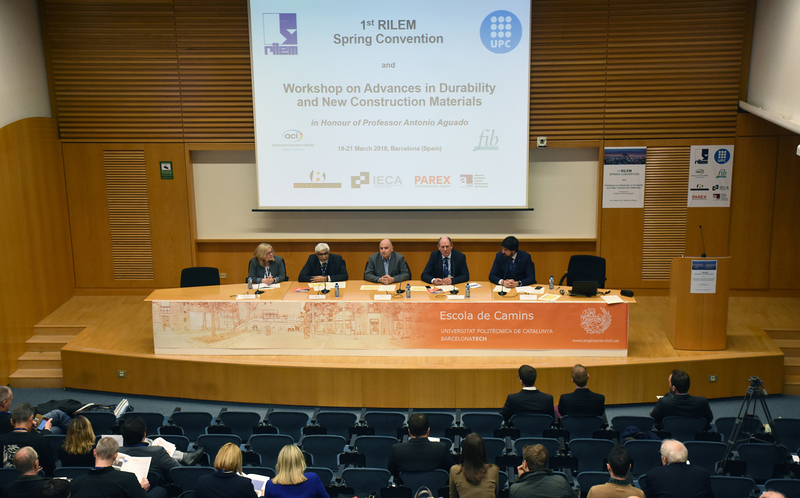 The 1st RILEM Spring Convention was a success! We had it all… and it was historical! The above is certainly a headline we can rightfully use to report on the first RILEM Spring Convention which took place in March in Barcelona. Our colleagues at UPC did a wonderful job in organising the event. A mix of standing committee meetings, a few TC meetings, interesting lectures at the workshop in Honour of Prof. Antonio Aguado, and two Colonnetti’s lectures marked the event, not to forget the very interesting visit to the Sagrada Familia. After a new website, the free RILEM app! The app gives you an easy access to the news, the events, the technical committees, and the network of members. You can also update your profile and pay your membership fees (if not done already). RILEM released its 2017 Annual Report which recounts the association’s activities and looks ahead to future challenges. We want to thank again all contributors. We look forward to an even better 2018. A pdf version of the report is available online on the website. Print copies are available upon request by contacting the Secretariat. Thanks to the Universitat Politècnica de Catalunya for having hosted such a memorable event! Dr. Sergio H. P. Cavalaro, School of Architecture, Building and Civil Engineering, Loughborough University: "Connecting the underground world with fibres"
Dr. Didier Snoeck, Magnel Laboratory for Concrete Research, Ghent University: "Superabsorbent polymers to seal and heal cracks in cementitious materials"
Videos of their lectures but also videos of the other lectures on that day are available on RILEM's YouTube channel. The TAC decided to change the title of the Technical Committee Secretary into Deputy Chair. The 2018 Robert L’Hermite Medalist, Fernando Moreno Navarro will give a lecture "Designing more durable asphalt materials". During the SLD4 conference and CONMOD2018 symposium special sessions will be organised on the topic “Concrete Modelling and Material Behaviour” to honour the retirement of Professor Klaas van Breugel. Please check the programme online. Technical Committee Meetings: If you want to organise a TC meeting in the margins of the Annual Week, please do not hesite to contact us. Deadline is 1 July 2018! The schedule of RILEM Standing committees can be found here. All members attending RILEM meetings must register on the conference website and list the meetings they are attending (link above). During the RILEM celebration at the ISAP conference in Fortaleza on 19-21 June 2018, a short retrospective will be presented showing the activities, impact and achievements of different RILEM Technical Committees (TC) over the last 50 years in the field of bituminous materials and asphalt testing. Over half of a century, the different RILEM TCs succeeded in producing numerous state of the art reports and scientific papers as well as various practice oriented recommendations that were discussed and presented in well attended RILEM conferences and symposia. Through international interaction and interlaboratory tests, RILEM has influenced the standardization, testing technology and methodical analysis of this important time- and temperature dependent category of engineering materials that is often treated as being in the shadow of cementitious materials. All that work would not have been achievable without the devotion of experts on a fully voluntary basis, of course. On May 25, 2018, a new European Union (EU) data protection law, the General Data Protection Regulation (GDPR), took effect. The GDPR gives individuals in the EU more control over how their data is used and places certain obligations on businesses that process information of those individuals. Under this new law, we deleted the old versions of the Directory of Members (available in you personal area). Only the most recent directory is now available. You still have the possibility to search for individual members in the Search Directory in your personal area (Personal settings/Network/Search directory). You can find an updated RILEM presentation in pdf on the Introduction page of the website. If you plan to present the association at a conference or in your organization, please contact us and we will send you the slides. Anne has been promoted to Deputy Secretary General. The promotion is a Bureau decision at the meeting in Barcelona. Congratulations to Sarah who got married last month! We wish her lots of happiness! Recommendation of RILEM TC 238-SCM:determination of the degree of reaction of siliceous ﬂy ash and slag in hydrated cement paste by the selective dissolution method. Unedited version of Testing and characterization of sustainable innovative bituminous materials and systems - TC 237-SIB. Edited by Manfred Partl, Laurent Porot, Hervé Di Benedetto, Francesco Canestrari, Paul Marsac, Gabriele Tebaldi. Unedited version of Properties of fresh and hardened concrete containing supplementary cementitious materials - TC 238-SCM, working group 4. Edited by Nele De Belie, Marios Soutsos & Elke Gruyaert. If you really can’t get enough of RILEM, find us at our LinkedIn and Facebook pages or on our YouTube channel! Thank you for subscribing to RILEM. Check out the new site, keep in touch to tell us how we’re doing, and have a great day! You receive this newsletter because you are registered on the Association's website: http://www.rilem.net. To change your contact email, connect to your private space.